What is the Difference Between a Callus and a Wart? 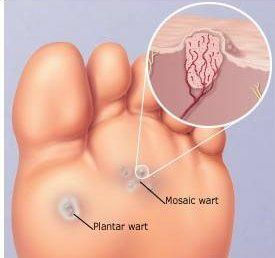 A wart is a small skin lesion found on the bottom of your foot or toes. Usually they are about 1 cm diameter; however, they can be much larger and surrounded by a small cluster of warts. This condition is caused by a virus and can be spread very quickly. Warts are not painful unless they are squeezed, pinched, or if there is direct weight on them. A callus is hard, dry, thick, and possibly even bumpy. There may even be a slight color of yellow or grey to its appearance. Unlike a wart, a callus is not caused by a virus and is not contagious. Instead it is caused by repeated pressure or friction on an area of skin. 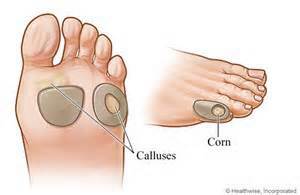 Similar to a wart, calluses are not painful unless they are squeezed or pinched. Even wearing shoes can be painful when you have a callus.